E-commerce gets all the attention at this time of year. Rightfully so, with U.S. retail e-commerce sales expected to jump 16.6% during the 2017 holiday season. Most LBN clients, however, are serviced-based businesses, so I wanted to show them some love during the holidays by taking a dive into the spreadsheets to see what I could glean from our local digital marketing campaigns that have run in the December timeframe. Three findings jumped out at me while poring over last December’s metrics. I have always thought of both Thanksgiving and Christmas as a huge travel holidays. But I recently read Thanksgiving travel is almost double that of Christmas. This got me thinking about the way consumers search online to see if a similar behavior pattern could be seen in our digital marketing data. I looked across all of our campaigns, which cover dozens of verticals and hundreds of categories, to make sure no one industry swayed the metrics. Sure enough, something in the data stood out. 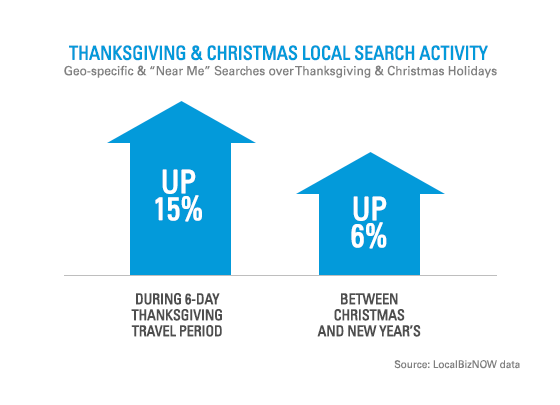 Geo-specific and near me searches jumped 15% during the six-day Thanksgiving travel period, while only increasing 6% between Christmas and New Year’s. This tells me consumers may alter the way they search when they are away from home or traveling. Another interesting find is related to the device people use when clicking on advertising. Mobile clicks increased 6% during the Thanksgiving holiday, while Desktop clicks increased 3% vs. average around Christmas. While there isn’t a perfect correlation with holiday travel in these numbers, it’s not a stretch by any means to assert most consumers are likely at home around Christmas. Most service-based businesses are not ramping up spend in December. The focus, of course, is on e-commerce and retail, so I wanted to see if any other verticals outperformed their average over the Christmas holiday. The two categories that did outperform aren’t all that surprising when you think about it. 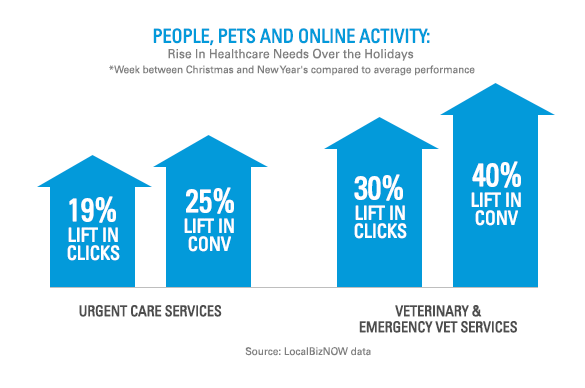 Urgent care and veterinary services well outperformed their average during the week between Christmas and New Year’s. Urgent care services saw a lift of over 19% in clicks and 25% in conversions vs. their average. Not to be outdone, veterinary services (including emergency services) were up by over 30% vs. their average for both clicks and conversions. This ranks as the third-highest such peak they see each year behind Fourth of July and Thanksgiving. I doubt all of the Christmas surge can be attributed to new puppies under the tree. Just like with urgent care, accidents and ailments assuredly increase around the holidays for humans and animals alike. One day you likely don’t have circled on your calendar in December is the 19th. Last year, the 19th was the last day consumers could use standard shipping without having to ship 2nd Day Air for packages to arrive in time for Christmas. 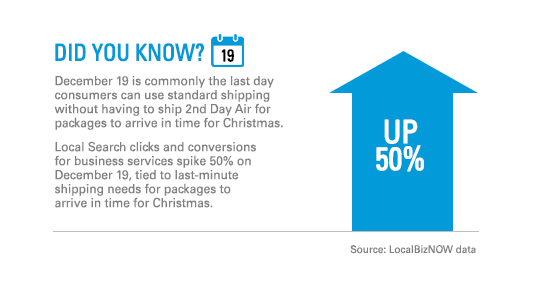 In the packaging and shipping services category, we saw over a 50% increase in both clicks and conversions vs. average on December 19th. This uptick happens every year and is usually the single highest volume day of the year for both clicks and conversions for our packing and shipping services clients. Consumers waiting until the last minute is not confined to shipping packages. We see upticks in the level of engagement across most verticals just before both Christmas and New Year’s when consumers know many service-oriented businesses are closed. On average, we see the conversion percentage jump seven percentage points for the three days prior to Christmas and 14 percentage points the three days before New Year’s. It shows that although consumers might procrastinate, they are still very focused on seeing their needs met online. 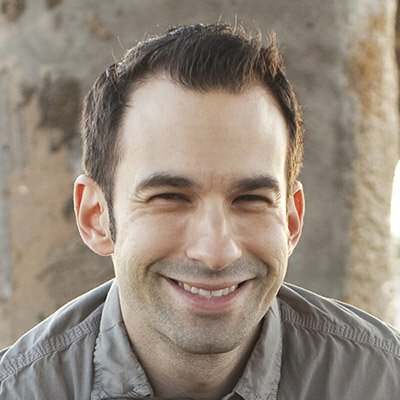 Matt Blackmore is LBN's VP of Digital Marketing. He manages Search Operations and Analytics Teams, and speaks and writes frequently about Digital Marketing. LBN's "The Differential" series explores and debates data, insights, concepts and trends impacting digital marketing.